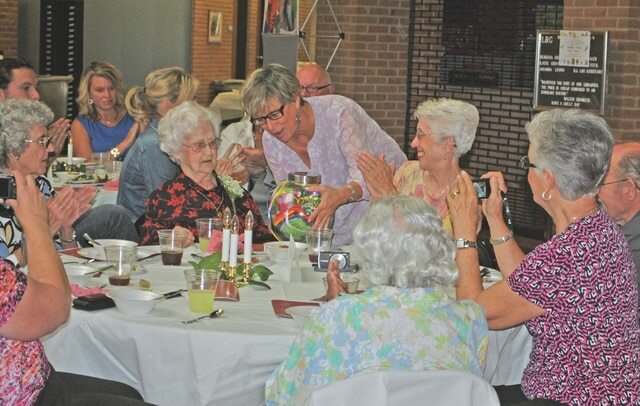 Pam Stricker, assistant regional director and publisher of The Wilmington New Journal, hands a gift to previous hall of fame inductee Patience Feike at the 2013 banquet. For more than 30 years the Highland County Women’s Hall of Fame has recognized women for their contributions to the community, and there is still time to nominate someone to be considered for this year’s induction. Committee chair Sue Smith said the hall of fame “is a great way for the community to come together to recognize” women who are “the silent workers” – the unsung who work and volunteer and never get recognized for what they do. “That’s why we do this,” Smith said. Think of a unique woman, one who has contributed to society, made a positive impact on the community, and been an inspiration to others and recognize her. Since 1981, two to four such women have been honored each year for their impact on communities in Highland County. Plaques bearing the names of all the women inducted into the hall of fame through the years hang in the first-floor hallway of the Highland County Courthouse in Hillsboro. Nominations are judged by impartial persons outside of the county, and those chosen to be inducted this year will be recognized at a banquet in August. Applications are available at the Hillsboro Library, Home Building & Loan in Greenfield, Southern Hills Community Bank in Lynchburg and Leesburg, and at The Times Gazette. Submissions must be post marked by June 30, 2015. Mail applications to Women’s Recognition Committee, Hillsboro Branch AAUW, P.O. Box 303, Hillsboro, Ohio 45133. Call Sue Smith for more information at 937-661-6148 or contact her by email at turnips@cinci.rr.com.